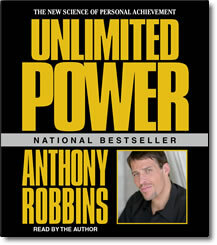 Unlimited Power – paperback by Anthony Robbins – Discount! IT’S NOT ABOUT POWER OVER OTHER PEOPLE. IT’S ABOUT POWER OVER YOURSELF! Yes, you can do, have, achieve, and create anything you want out of life. Anthony Robbins has proved it. The undisputed master of the magic of mind power, shows you in this audio program how to harness yours. He demonstrates—passionately and eloquently—that whatever you think will be, that your state of mind determines what you can and can’t do, and that all successful results can be modeled and duplicated. In the live audio recording, Tony’s enthusiasm is contagious. He calls Unlimited Power the new science of personal achievement. You’ll call it the best thing that ever happened to you.